Accredited status is awarded for service and clinical quality that meet the basic requirements of NCQA’s rigorous standards for consumer protection and quality improvement while Interim is awarded for those organizations with basic structure in place that will need to undergo a new review within 18 months to demonstrate they have executed those processes effectively. 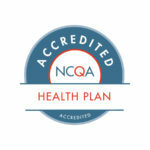 NCQA evaluates the quality of health care that health plans provide to their members and how well a health plan manages all parts of its delivery system — physicians, hospitals, other providers and administrative services — in order to continuously improve the quality of care and services provided to its members. NCQA Health Plan Accreditation includes rigorous on-site and off-site evaluations of over 60 standards and selected HEDIS® measures. A team of physicians and health plan experts conduct accreditation surveys. A national oversight committee of physicians analyzes the team’s findings and assigns an accreditation level based on the performance of each plan being evaluated to NCQA’s standards. A trained team of health care experts, including physicians, conduct a rigorous on-site survey of the health plan. NCQA uses information from health plan records, consumer surveys, interviews with plan staff and performance on selected HEDIS® measures.